With features and a design that have never been seen before in the industry, our hybrid embosser is sure to raise the bar for standard embossers. These stunning hybrid embossers have the size and portability of a pocket embosser but also the comfort of a desk embosser model. Packed with ingenious features designed specifically for the end-user, like a clear signal when the impression is made properly on the paper as you will hear it "CLICK" and positioning marks that were designed to help you with perfect impression alignment. 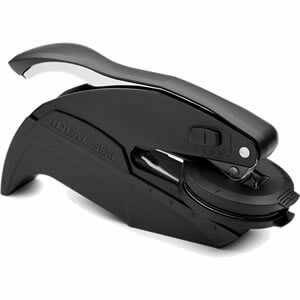 Minimal effort is needed to create a crisp and professional notary seal on documents since this hybrid notary seal press can be used with minimal effort. This pink hybrid notary embossing seal is the perfect addition to a notary's toolbox. With an ergonomic handle and bright color, it's sure to make your day as a notary a brighter. This hybrid embosser has a smaller reach and a multi-positional gripped handle allowing even the most petite hands to find a comfortable position to create a stunning impression. Every aspect of this embossing seal was created with the end-user in mind - This hybrid notary seal is our most customer-friendly embosser yet! Dress up your desk with this professional black hybrid notary embossing seal. 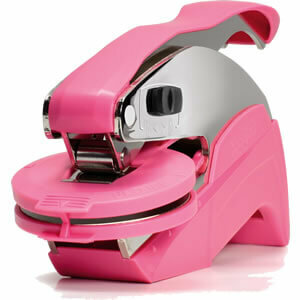 Sure to impress your clients, this embosser will give you an added touch of sophistication when notarizing a document. The integration of leverage and shape on this hybrid embosser requires less force to produce a clean impression every time. This hybrid embosser has a smaller reach and a multi-positional gripped handle allowing hands of all sizes to find a comfortable position while embossing.